School pupils in Singapore lead the world in maths and science, the latest international report suggests. Of 360,000 pupils aged 10 and 14 in more than 40 countries in the Timss study, those in Singapore had the best average scores in both subjects. England's pupils did well in science but in the older age group too few schools took part, so their results are in a footnote in the report. Scotland, the other UK nation involved, fared less well in both subjects. This is the second time in two weeks that England has failed to figure in major international rankings because of low participation. The UK as a whole was left out of the PISA rankings last week because not enough schools in England could be persuaded to take part. The latest analysis is from the four-yearly Trends in International Mathematics and Science Study (Timss). It was organised by the International Association for the Evaluation of Educational Achievement and co-ordinated by researchers at Boston College in the US. This is the third Timss report, involving pupils typically aged 14 ("eighth grade") in 46 countries and typically aged 10 ("fourth grade") in 25 countries. Tests were tailored to each participating country's curriculum, main language and culture. The researchers said Singapore students at both grade levels were easily the top performers in maths and among the best in science, with the highest average scores. Those from South Korea, Chinese Taipei and the Hong Kong region of China also performed very well across the two subject areas. 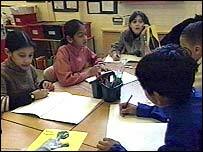 England's school participation rate for the older pupils was below the minimum 50% of those asked. For the younger pupils it was satisfactory. The National Foundation for Educational Research, which did the England part of the study, said schools' performance in national tests had been taken into account to ensure the older pupils' results were in fact representative. England's 10-year-olds achieved an average score of 531 compared with 479 in Scotland and an international average of 495. Scotland's older pupils scored 498 in maths compared with the international average of 467. England's result, given in a footnote, was also 498. Scotland's pupils were the youngest in the study, with an average age of 13.7 compared with 14.5 across all the countries. In science, Scotland's older children scored 512 compared with an average of 474 and England's footnote 544. The younger English pupils scored 540 in science - putting them fifth internationally - against the average of 489 and 502 in Scotland. Because this 2003 round of testing was the third that has been done, the researchers were able to identify trends since 1995. In mathematics, at the eighth grade, countries with significant increases in achievement included South Korea, Hong Kong, Latvia, the United States and Lithuania. A number of countries had declined, including Japan, Belgium (Flemish), Russia, the Slovak Republic, Sweden, Bulgaria, Norway and Cyprus. At the fourth grade, countries showing significant gains between 1995 and 2003 included Hong Kong, Latvia, England, Cyprus, New Zealand and Slovenia. Only the Netherlands and Norway had significant decreases in achievement. England's Schools Minister, Stephen Twigg, said: "The fact that our pupils have made bigger progress in maths than any other country highlights how our numeracy strategy has brought real dividends, and is testament to the hard work of teachers and pupils." But Conservative spokesman Tim Collins said: "Yet another authoritative study shows Britain's schools are performing much worse in maths than our international competitors, and little better in science. "In an increasingly knowledge-led international business environment, we need to be outpacing countries like Japan, Singapore and our European neighbours." In science, countries that showed significant improvement at the eighth grade included South Korea, Hong Kong, the US, Australia, Slovenia, Lithuania and Latvia. Countries with significant decreases included Sweden, the Slovak Republic, Belgium (Flemish), Norway, Bulgaria, Iran and Cyprus. At the fourth grade, many countries showed significant improvement, including Singapore, Hong Kong, England, Hungary, Latvia, New Zealand, Slovenia, Cyprus and Iran. Performance in Japan, Scotland and Norway declined. The best performer in this Timss report, Singapore, was not in the PISA study, reported last week. Finland, which outperformed other countries in PISA's maths, science and reading tests, did not take part in Timss.